The magnificent scenery and breathtaking beauty of the Mu Cang Chai District may very well and truly be the most heart-stoppingly exquisite beauty our incredible world has to offer. 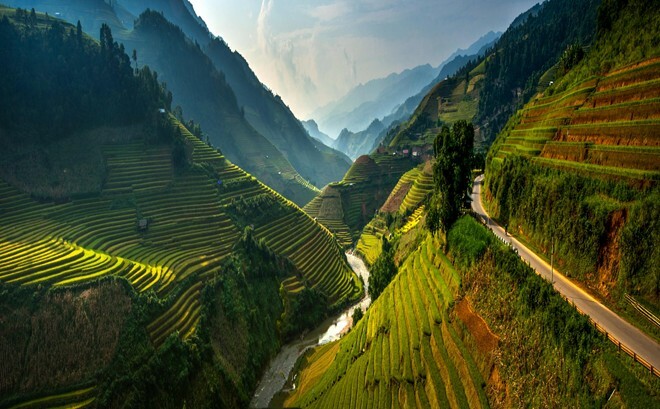 Mu Cang Chai District, located in the northeastern part of Vietnam and some 1000 meters above sea level, is perhaps more unique than any other destination in the world because of its terraced rice field treasures. That, along with its beautiful, humble, and authentic culture, make it a destination that will forever live in the heart of the traveler. 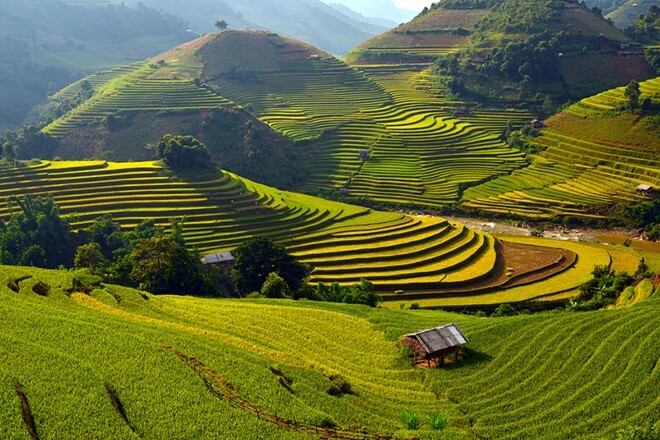 Mu Cang Chai is mainly composed of terraced rice fields that travel down the mountainside. 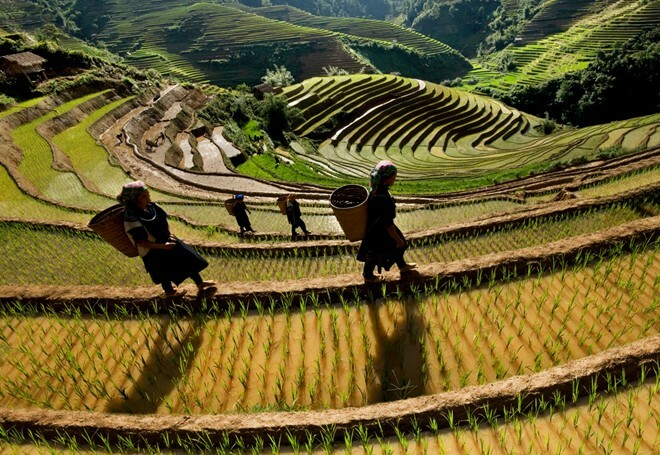 The natives created this ingenious way to grow and harvest rice, and thus create a way of life for themselves and families, when normally rice is grown more easily on plateaus. 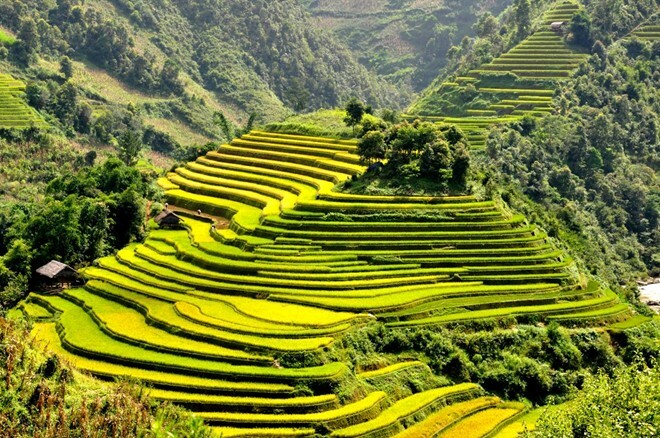 The natives found that by growing their rice in these terraced ways, it prevented water from trickling down the mountain, which would have resulted in their rice crops not receiving enough water. The result is astonishing. These awe-inspiring terraced fields have drawn tourists and photographers alike to witness its sublime beauty in person. District during the time of harvesting the rice, which is in September and October of every year, just as Autumn is ending. At that time, you can see rows and rows of staggering gold all around, as if a beautiful silk scarf has been draped on the mountain, exquisite and majestic against the bright cerulean sky. It is sometimes hard to believe that there truly is so much beauty in this world. When seeing the terraced rice fields from afar, it is a picture-perfect view of resplendent beauty, with sharp and lovely colors that shift and change as the seasons change. Not only is the environment and scenery likely to leave you stunned and breathless, but the people that populate Vietnam’s Mu Cang Chai District, who are mostly comprised people of the H’Mong and Thai ethnicities, are a kind, humble, gracious, and hard-working people who only add to the unique beauty of the Mu Cang Chai District. Their humble way of life is so startlingly different than most in our world, and it is endearing and lovely to visit such a beautiful, majestic landscape with just as beautiful and kind people. Making Vietnam’s astonishing Mu Cang Chai District your next vacation destination will not disappoint, as it is something that one has likely never seen before, or ever will again, as it is one of the most uniquely magnificent places in our lovely world, and it’s thrilling and heart-stirring beauty will remain with one for a long time, reminding us that there is always beauty in the world, if we only choose to seek it out and find it.